The many peaks in the Prince of Wales Range feature some of the greatest views of the Johnstone Strait; the distant peaks to both the east and west aren’t too hard on the eyes either. If you haven’t had a chance to hike in the region yet, I urge you to throw on some boots and head for the hills! 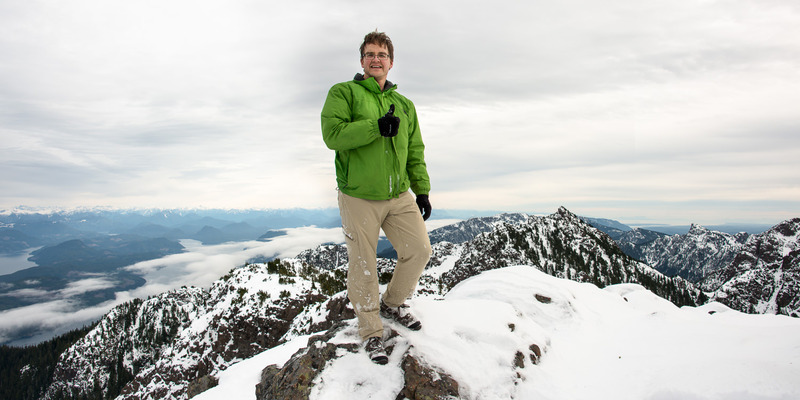 My first hikes in the area were only this past summer, first when Phil and I hiked Mount Kitchener, and then when Phil led an Island Mountain Ramblers hike up the Stowe Creek Trail to H’Kusam Mountain. Having enjoyed these hikes, we eagerly planned to do another; we even entertained the idea of summiting Springer Peak and Stowe Peak in the same day. Ultimately, however, we would only achieve the first peak; conditions were wintery, and even at the lower elevations frozen ground made progress slow and dangerous. Trail conditions were surprising. We anticipated a trail similar to that of the Stowe Creek Trail, but the two were nothing alike. 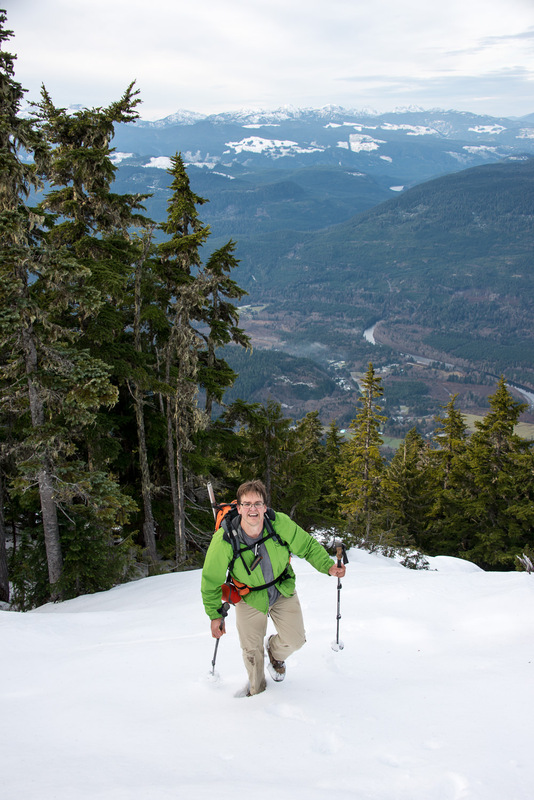 Although Bill’s Trail is very wide and easy to traverse, it terminates around 1000 metres and transitions into the more traditional Vancouver Island mountaineering route: up and over rocks, through steep sections of moderately exposed forest, and featuring several viewpoints. This transition turned me into a liar! In my trip description, I classed the hike as steep Class 2, obviously underclassed. Bill’s Trail leads from Seaward to the col between Stowe Peak and H’Kusam Mountain. The trail is notoriously used in the H’Kusam Klimb, and the event produces a great map with many features marked. Our early morning departure from Nanaimo permitted a great start time at the Sabre Road trailhead; we were hiking by 8:00 am. The day was cold. We started at 50 metres in elevation and the temperature was only -2, with the ground and trees covered in heavy frost. The gravel and soil crunched continuously as we made progress up Bill’s Trail. The route is easy to follow, but you must bring a map. There are a few sections where the trail bifurcates, and the offshoots often don’t rejoin the main trail; it would be easy to get lost in the lower sections. In the higher elevations, Bill’s wide trail ends and a more traditional narrow, steep, and rocky route continues on. In these higher sections, the frozen ground and rocks made for slow progress up the hills as we carefully chose our footing. On both the way up and down, each of us fell several times. Once, Phil took a fall that turned into a slide down the frozen forest floor. 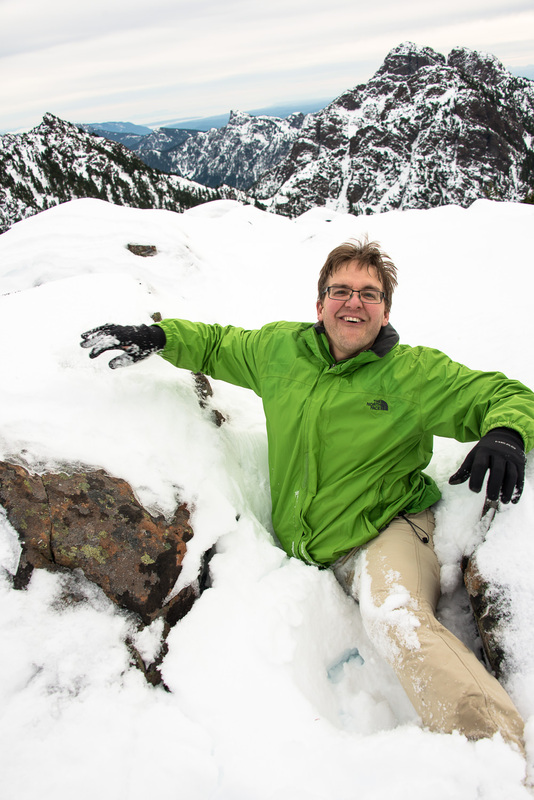 With firmly planted feet, I reached out and grabbed his poles as he slid down the steep slope past me. Fortunately, he was just at the start of his slide – otherwise his mass may have pulled me off my feet too. Phil taking his first steps on snow! The trail continues up toward the col between Stowe and H’Kusam, but our goal required us to step off the path before the lake. There is a large professional sign on the trail indicating the junction for Bill’s Trail, and the route then heads off into the forest. By the time we reached the turn-off, more than a few inches of snow had accumulated on the ground. If there is a booted path, we couldn’t see it, and route markers (flags and cairns) are far between. Regardless, we worked our way through the woods and up the hill toward the summit. At some point, we lost the marked route and we came to a short snow-covered Class 3 step. I was inclined to route around to the right, but as we looked up the short gully we spotted a ribbon at the top. The exposure is very limited, but the snow added some extra risk to the short rise. Achieving the top of the step, I pondered my posted trip description, wherein I described it as simple Class 2 hiking, and realized I had underclassed it. Certainly the conditions changed the nature of the hike, but regardless of weather, it was more than a simple Class 2. As the three of us continued up, we found the edge of the ridge and peered over into the gully between the ridge and the next section of the massif. As we walked southeast along the ridge, Paul decided to sit the next section out. It looked tough, and he had pushed himself past his comfort zone; I felt guilty. We left him with a radio, seated safely at the start of the next rise. We hiked up some crow-berry to the next flat section (about 15 feet) and discovered that we could see the day’s goal: a green repeater tower was just visible, and not far away! Though the distance was short, travel was slow. The uneven ground was littered with deep snow drifts, up to my groin in some places. Regardless, within 15 minutes of leaving Paul, we were at the summit. We radioed to Paul that we were at the top. We decided to stay there for some lunch and photographs before heading back down. I was tempted to radio Paul and tell him to come on up. The final section was much easier than many of the more challenging sections he had hiked already. However, I respected his limits and resisted my urge. It took us about four hours to reach the summit at 1604m, nearly 1550 metres of elevation gain. A respectable time, despite being slowed by the conditions. Once we met up with Paul, we picked a different route down. 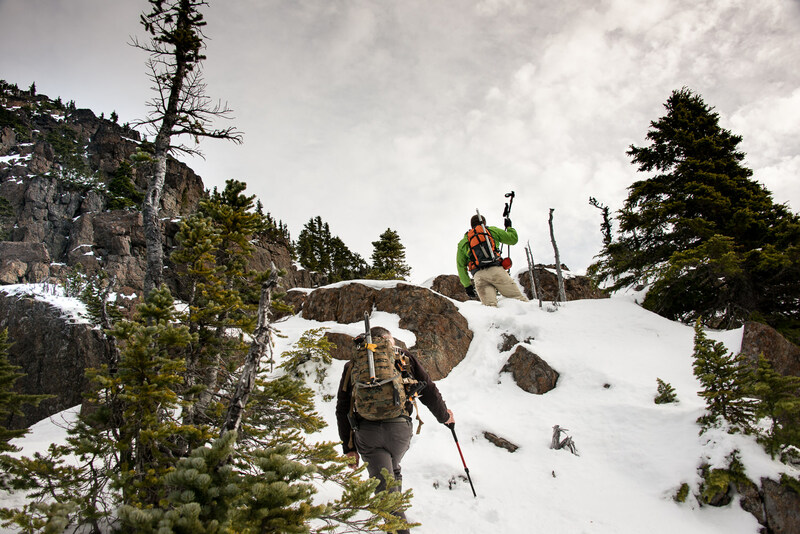 We hiked more to the southeast and found an easy route down through the trees and snow. We completely avoided the slippery rock step. Once descending below the step, we merged with the route we came up, and continued on this for the entire trip back to the car. Many of the morning’s treacherous sections were easy in the warmer afternoon temperatures – however, we still had numerous falls. I’m sure each of us came home with a bruise or two. We arrived back at the car around 3:00 pm, before the light of the day dispersed -slightly bruised, tired, and happy. I would make it home in plenty of time to have dinner with the family and put my little guy to bed. If you add this hike to your list, I recommend waiting for more snow, or conversely wait for much warmer temperatures.